Halloween is approaching quickly. 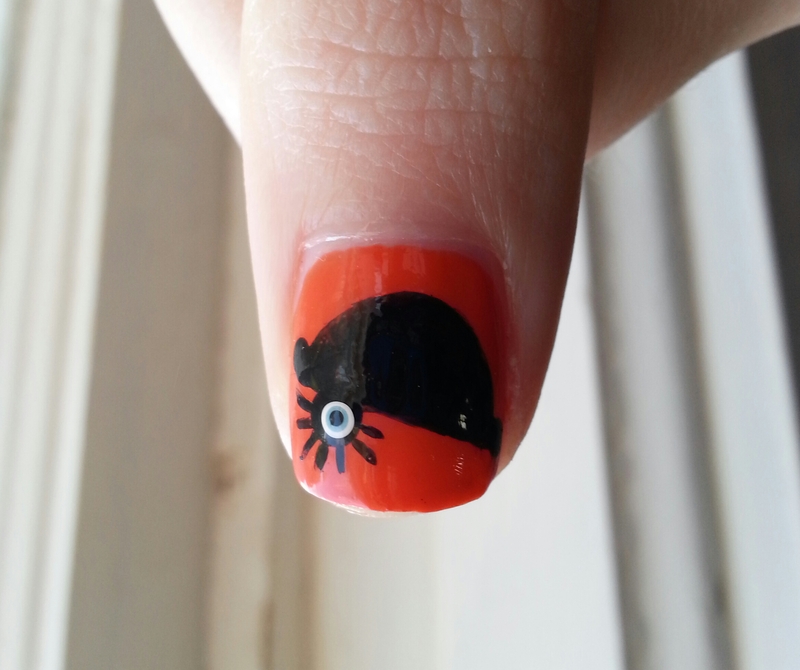 I thought about doing a few manicures for the holiday, but I really didn’t want to do the normal bats, ghosts, and mummies. (I did that last year. I will post those at some time.) 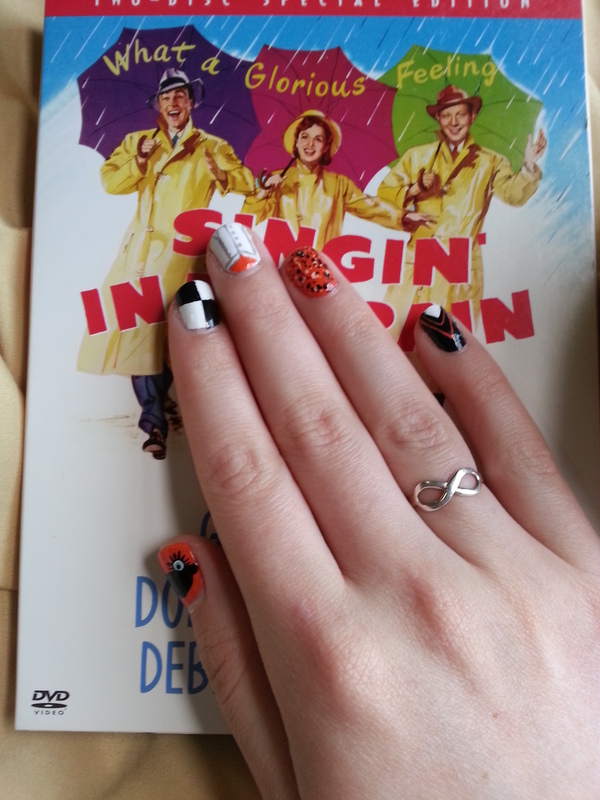 Instead, I wanted to do a manicure inspired by a movie that frightens me. A Clockwork Orange is not really a horror movie, but it creeped me out majorly. If you have not seen the movie, you need to. I have not yet read the book, but it is on my list. Malcolm McDowell is so brilliant as Alex DeLarge. What him and his gang do to innocent, random people is terrifying. What is done to Alex to reform him is terrifying. Definitely a must watch. 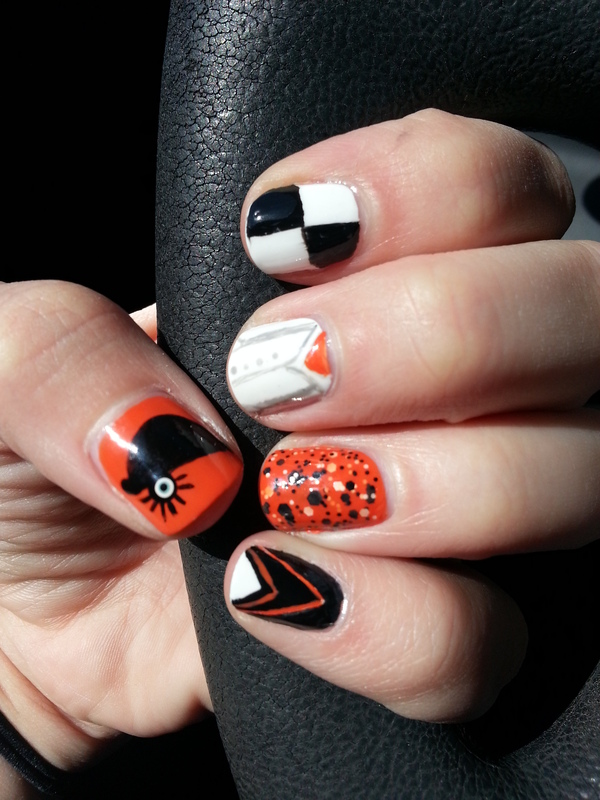 I really like how the mani turned out. My suspenders could have been a bit better, but other than that, it looks awesome! 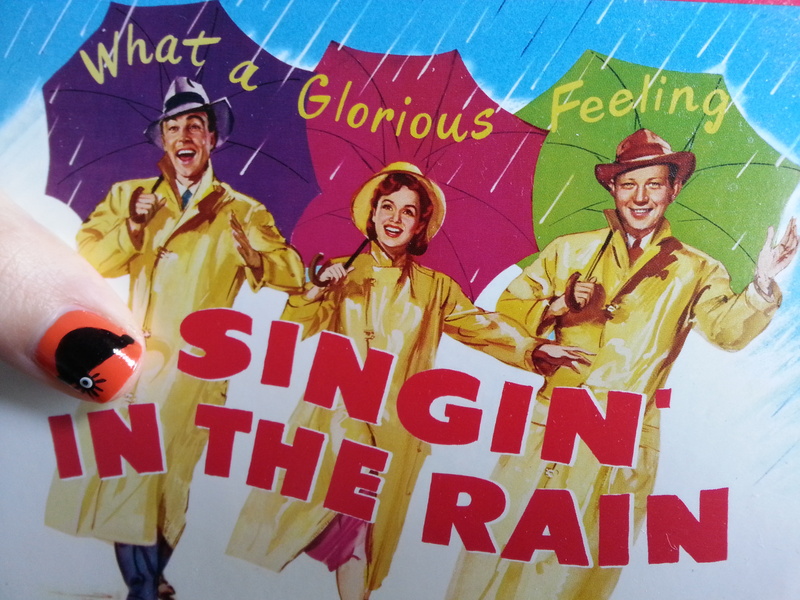 For those of you who have seen the movie, you will understand the Singin’ in the Rain reference. 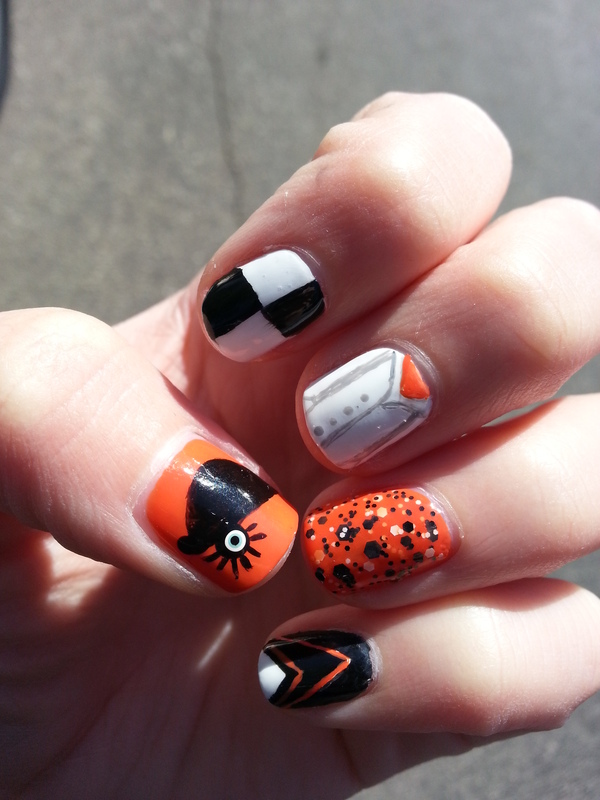 I think I may do one or two more Halloween movie inspired manicures. It was a lot of fun! As always, don’t forget to add me on Facebook! 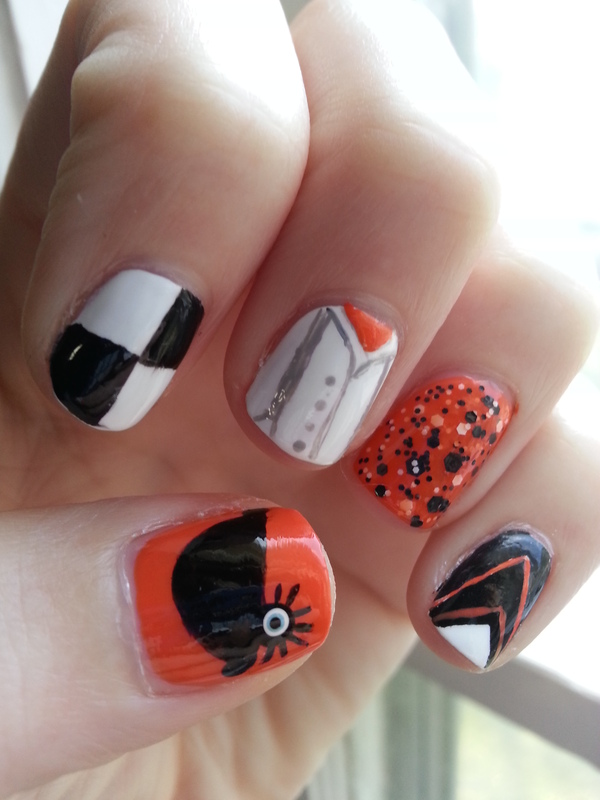 This entry was posted in Beauty, Nail Art and tagged a clockwork orange, a clockwork orange mani, a clockwork orange manicure, a clockwork orange nail art, a clockwork orange nails, beauty, black nails, checkerboard, chip skip, colorshow, design, fashion, gelous, halloween, halloween mani, halloween manicure, halloween nail art, halloween nails, inm, inm out the dooor, mani, manicure, maybelline, maybelline colorshow, megalast, nail art, nail design, nail polish, nood mood, o.p.i., opi, opi chip skip, orange nails, out the door, singin in the rain, singing in the rain, tape manicure, triangle, wet n wild, wet n wild megalast, white nails. Bookmark the permalink.